DESNOS - Du Méridien et de l'Équateur. DESNOS, L.C. / DE MORNAS, B. - Du Méridien et de l'Équateur. Du Méridien et de l'Équateur. - DESNOS, L.C. / DE MORNAS, B. Title : Du Méridien et de l'Équateur..
Map maker : DESNOS, L.C. / DE MORNAS, B.. Size : 15.2 x 20.5 inches. / 38.5 x 52.0 cm. 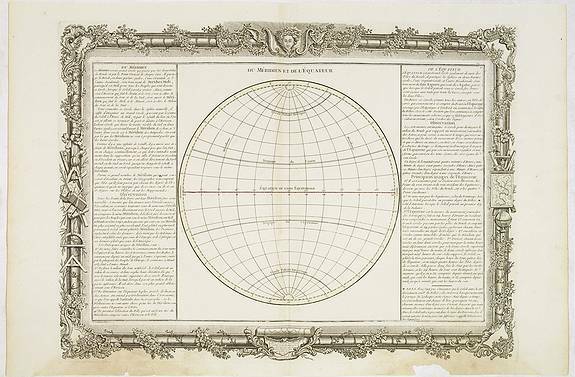 Description :Decorative chart of one hemisphere divided into meridians and showing the main celestial circles with the equator coloured in red. Left and right a box with information about the equator and the meridians. Prepared by Buy de Mornas, who was a professor of geography and history and published by Louis Charles Desnos, active in Paris at rue St.Jacques. Printed within a very decorative border frame (drawn and engraved by Martinet) entwined with garlands of leaves and flowers, including surveyors and draughtsman's tools e.g. triangles, compasses, rulers, telescopes, a map and globe, with a mythological figurehead crowned with leaves in top center, and the address of the publisher. This edition with remarkable decorative borders found only in the deluxe edition. Condition : Water stains in lower margin, just affecting printed border. Splits on lower margin one of which attaining the copper mark. Dark impression.